Hundreds of women vendors in Imphal staged protest on Saturday. 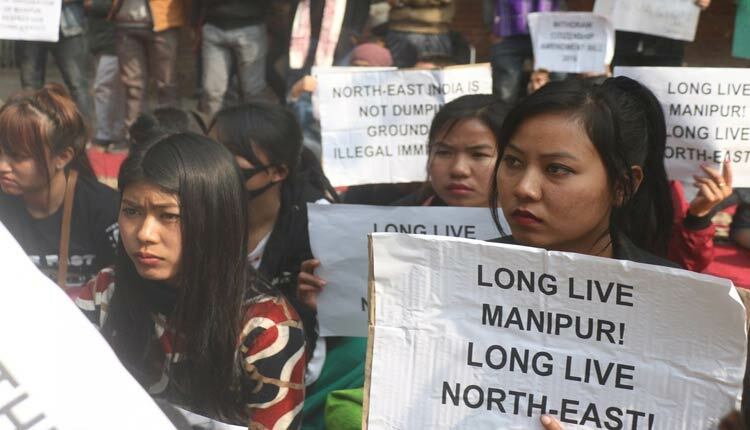 Hundreds of women vendors who exclusively run three main markets in Imphal staged a 12-hour sit-in protest on Saturday demanding a written assurance from the state government that the Citizenship (Amendment) Bill, 2016, will not affect Manipur and other northeastern states. A similar strike was imposed in Assam on Saturday after Prime Minister Narendra Modi arrived in Guwahati on Friday to start his two-day visit to Assam, Arunachal Pradesh and Tripura. There have been nocturnal torch light procession by the womenfolk in many parts of Manipur. On Thursday, a mass protest was held here. Several protests against the Bill are being held in the northeastern states ever since it was passed by the Lok Sabha on January 8. It is still awaiting the nod of the Rajya Sabha.